Estonia /[invalid input: 'ɨ']sˈtoʊniə/ ( listen) (Estonian: Eesti), officially the Republic of Estonia (Estonian: Eesti Vabariik) is a small country in the Baltic Region of Northern Europe. The capital city is Tallinn. Estonia's neighbors are Sweden, Finland, Russia and Latvia. Its population is 1,332,893.
a. Võro and Seto in southern counties are spoken along with Estonian. Russian is still unofficially spoken in Ida-Virumaa and Tallinn, due to the Soviet Union's program promoting mass immigration of urban industrial workers during the post-war period. b. Including 5.4% Võros and 0.93% Setos.c. SDE member but nonpartisan while serving. d. 47,549 km2 (18,359 sq mi) were defined according to the Treaty of Tartu in 1920 between Estonia and Russia. Today the remaining 2,323 km2 (897 sq mi) are still occupied and part of Russia. The ceded areas include most of the former Petseri County and areas behind the Narva river including Ivangorod (Jaanilinn). Pechory remains under Russian control. e. Estonian kroon (EEK) before 2011.
f. Also .eu, shared with other member states of the European Union. Estonia became a member of the North Atlantic Treaty Organization (NATO) on 29 March 2004. It joined the European Union on 1 May 2004. 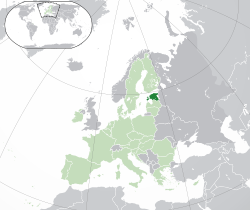 Estonia is east from the Baltic Sea and the northest of the Baltic States. The Riigikogu is the name of the parliament in Estonia. Estonia is divided into 15 counties (maakond): Harjumaa, Hiiumaa, Ida-Virumaa, Jõgevamaa, Järvamaa, Läänemaa, Lääne-Virumaa, Põlvamaa, Pärnumaa, Raplamaa, Saaremaa, Tartumaa, Valgamaa, Viljandimaa, Võrumaa. Estonia has many forests, almost 50% of the land is covered with forests. Estonia has over 1,400 lakes and 1,500 islands. The following are links to international rankings of Estonia. According to speedtest.net Estonia has one of the fastest Internet download speeds in the world with an average download speed of 27.12 Mbit/s. ↑ "Population by ethnic nationality, 1 January, year". stat.ee. Statistics Estonia. Retrieved 2 July 2012. ↑ "Statistics Estonia". Stat.ee. 1 January 2011. ↑ (in Estonian and English) (PDF) 2012. Aasta rahva ja eluruumide loendus (Population and Housing Census). 1. Statistikaamet (Statistical Office of Estonia). 2012. ISBN 9985-74-202-8. http://www.stat.ee/63779. ↑ 4.0 4.1 4.2 4.3 "Estonia". International Monetary Fund. Retrieved 18 April 2012. ↑ 5.0 5.1 "Human Development Report 2011". United Nations. 2011. Retrieved 14 August 2011. ↑ "Võrokesed ees, setod järel". Postimees. 13 July 2012. ↑ "World Bank, World Development Indicators - Google Public Data Explorer". www.google.com. ↑ "Reports and Publications". Save the Children. ↑ "Household Download Index". Retrieved 12 February 2012. Wikimedia Commons has media related to estonia.